As we settle into the new year we are afforded a good opportunity to look back at the year that has passed and what has been achieved and what projects that have been completed. It is also a good opportunity to look forward to the year ahead with optimism and wonder what exciting opportunities may be around the corner. From an design perspective it is a very good time to look at what is happening in the world of interiors. Over the last couple of weeks I have been paying attention to many of the magazines and blogs which look towards the New Year and the trends they expect to be popular. Although many of these articles vary a lot there is a great deal of overlap within their content and in my opinion this overlap is indicative of what I see daily on Instagram and pinterest as I carry out research for current projects. In this post I outline some of these trends and examine the bearing they have on the world of bespoke furniture design. We are all influenced in one way or another by our environment and what we see around us and the same is true of furniture designers. When designing a piece of furniture current trends play a part in steering the direction of the concept but one has to be careful not too align with them too closely. One of the main attractions of commissioning a piece of bespoke furniture is creating something to suit the clients specific tastes , something which differentiates itself from mass produced pieces and something which indicates the individuality of the client, their environment and their lifestyle. Another attraction of commissioning the design and manufacture of a furniture piece is the longevity of the item. This should be an item which is created with great care from high quality materials and should not only stand the test of time physically but also stylistically. These pieces are designed to last a lifetime and remain a constant in the homes of their owners as the interior design may change with passing trends. The greatest challenge a furniture designer faces is to create an item which is timeless in this way. Something which compliments the trends of a certain time, sit well in an interior setting without leaning too closely towards it. We aim to design not just for today and the world we are in currently but also for tomorrow. With the passing of time we can look back at designs of the past and judge them on the way they age or more appropriately the way they don’t. Bearing this in mind its interesting to look at where trends are at the moment, to be aware of our surroundings but be mindful to not to get too swept away on any of the transient waves of style that will move away from relevance in the same way that they moved towards it. Bearing this in mind lets look at where trends may take us in 2019 …. from a safe distance. Dark dusky colours have been very popular over the last couple of year’s especially dark rich greens and dark blues or navy’s. Magazine previews of 2019 trends predict that these colours will continue to be very popular. These colours used extensively in wall paint, soft furnishings, curtains and sofas are accented with bright colours such as mustard or amber or with earthy tones such as soft pinks, terracotta, sand and rust colours, tans and corals. This is verified by the Pantone revealing “living coral” tone as their colour of the year for 2019. The following image illustrates a range of colour palettes outlining popular colours over the coming year from varying online sources. Natural wood is a very safe material as regards trends as it seems to be omnipresent in interior fashions in one form or another at any given time. Over the last few years there appears to be a trend towards darker toned woods which are accented with brighter metal fittings and fixtures. This lends itself well to the colour schemes outlined above and to the revival of art-deco. “Luxe” seems to be a buzz-word given to a trend which uses very sumptuous and luxurious feeling materials to create colourful art-deco inspired interiors. Many of the colours and trends predicted to be popular in 2019 lend themselves very well to this style. The use of velvet continues to be very popular in sofas, cushions and soft furnishing and this is very much indicative of this trend. Metal accents are also used throughout with Brass, rose gold and bronze being used throughout. This is seen in taps, handles, hinges and light fittings. The numerous guides to interior trends in 2019 suggest a drop off in popularity in rose gold at the expense of brass. Shapes such as scallops and the inclusion of curved sofas are also common themes. Brace coffee table created in Ash with a white tinted oil finish, a popular wood species and finish in Scandinavian/Nordic styled furniture. Another trend which appears not to be waning in popularity is the minimalist Scandinavian/Nordic style. 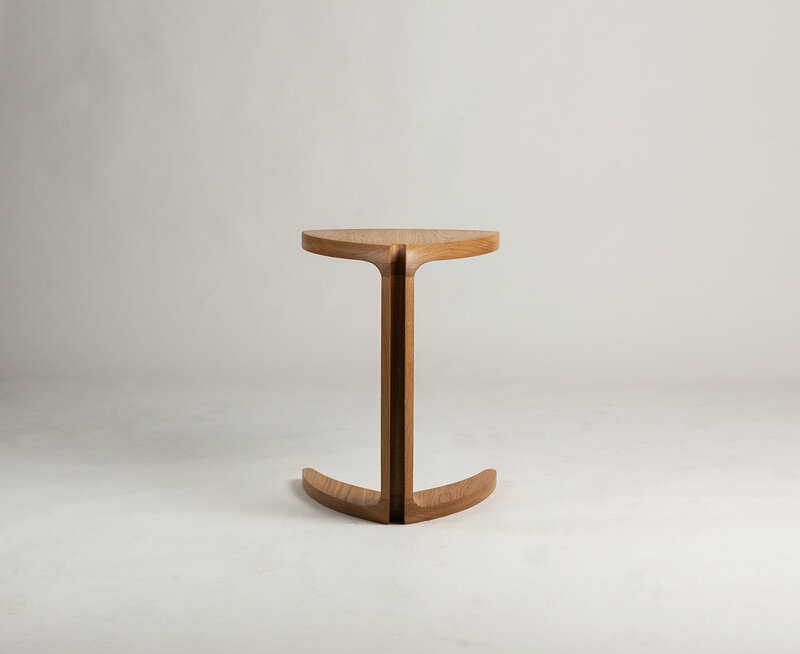 Simplistic elegant furniture design in light coloured wood such as Birch or Ash, this style often incorporates round sectioned components and this is a trend which can be seen in a new range of furniture called OVO designed by the architectural firm Foster and Partners for Benchmark. 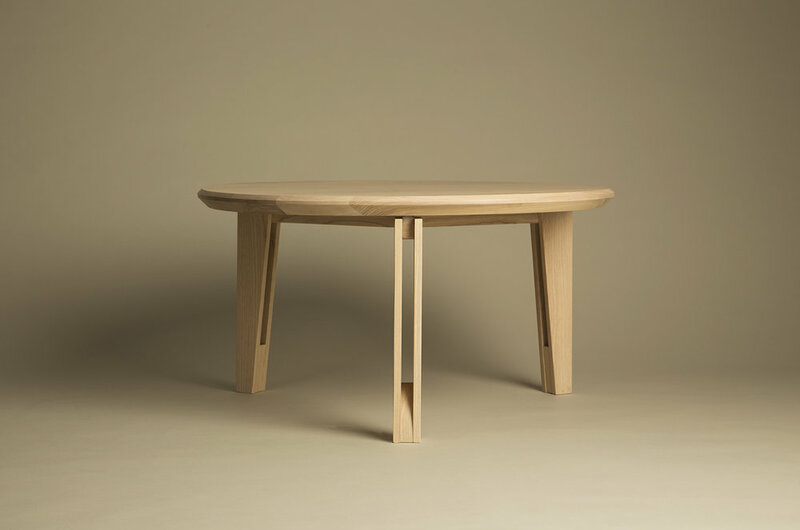 One of the latest pieces we have created which have been on display this summer at New Designers One Year On and at the Celebration of Craftsmanship and Design, Cheltenham is the Retrospect Side-Table. This side-table, the second instalment in the Retrospect series of furniture is inspired by Scandinavian mid-century design. It pays particular homage to atomic age design of the 1960's and 1970's. A playful piece with a dynamic aesthetic, its design with a main “body” supported by four curved legs aims to give the impression that the piece has the ability to move or may just have been moving before being viewed. It is also intended to be a utilitarian and versatile piece that can be used in various rooms within a building. It is as well suited for use as a bedside table as an occasional table in a lounge or sitting room. Corner Detail of the mitre joint reinforced with splines. The storage box that acts as the main body of the piece is created from solid American Black walnut. Mitre joints on the corners give the piece a clean, crisp and simplistic appearance which is accented with Ash splines which are not just decorative but also perform the function of locking the joint together. This box is open at both ends allowing items stored within to be accessed easily from either side and are seen more easily as they illuminated by the light which is allowed to pass through. New Designers returns this year to the Business Design Centre London. Now in its 32nd year New Designers has become one of the most important events in the design calendar and arguably the most important for emerging Design. Within the exhibition One Year On looks at previous graduate exhibitors and designers who have taken the first steps on their design career paths. I am both excited and honoured to be taking part in this years edition of New Designers One Year On and to display my work in such a remarkable setting. Part two of the show runs from 5th to 8th July and focuses on the design disciplines of Furniture, Product and Industrial design, Spatial design and interiors, Graphic Design, Illustration and Animation and Motion and Digital arts. This year sees one year on exhibition expanding to become its biggest edition to date with part two being comprised of 31 exhibitors. New Designers will be an excellent opportunity to launch new work and there are a number of pieces in the pipeline. The above image illustrates one of these designs which has just been completed. Retrospect side-table is the second instalment in the retrospect range of furniture inspired by Scandinavian mid century design. In the coming weeks it will be joined by the third edition, the retrospect wall mirror. These will be shown alongside the retrospect sideboard which will complete the collection. The retrospect sideboard is shown below. Preparation work has already started for the show and further posts in the coming weeks will outline this work as the show draws nearer. For further information about New Designers and its exhibitors clicking on the New Designers logo at the top of the post will lead you to the site. We are very pleased and excited to announce that a select range of our products have been chosen to appear on the Hand-picked website www.hand-picked.co.uk. Handpicked is a boutique online store, selling the finest in homeware, furniture and accessories which have been hand-selected by the website’s creators. An approach which brings together interesting pieces for your home in one place. Hand-picked is an exciting brand new venture and we wish Inessa and the team the very best of luck with it. Clicking on the image below will lead you to the site to have a browse for yourself. As with any of our products these coffee tables are manufactured to order and can be individualised to suit your taste. To find out more about our bespoke commissioning service click on the image below. The March issue of House Beautiful Magazine is now on sale and we are delighted that our Retrospect sideboard has been included in the "New Seasons Trends" advertorial which can be viewed in the image below. It is exciting to see one of our products among such a lovely array of household products. We especially love the animal print collection from www.giraffesandunicorns.co.uk. The sideboard which is featured is created from solid walnut and features a bank of drawers which have been created using traditional hand-cut dovetail joints. It also features red trim between the cabinets and on the cabinet and drawer interiors. 2017 will see the retrospect range expand with sideboards made from different species of wood and with different coloured trim. It is also our aim to create Retrospect entirely from Birch Plywood which we feel will really compliment its Scandinavian aesthetic. This version will sit at the other end of the cost scale from our walnut version meaning that a clients can tailor their sideboard to suit their budget without compromising on style or on quality. As with any of our products Retrospect are manufactured to order and for this reason each sideboard can be as individual as those who will use it for years to come. To find out more about our bespoke commissioning service click on the image below. Country Collections Feature in the February edition of Country Living UK Magazine. This months edition of Country Living magazine features our very own Tephra Coffee Table. Designed and created in 2016 and exhibited at the Celebration of Craftsmanship and Design, Tephra has proved to be one of our most popular pieces to date. Hand shaped from Native Ash, fifty of these pieces will be made in total, each one numbered and branded on completion. Orders are now being taken for the remaining tables which will be created over the coming months. Please be aware that there is a lead time of 6-8 weeks from time of order. To find out more about Tephra or to see our full range of products click on the image above. To contact the studio for further information click on the image below. This weekend, one of the most important in the design calendar, sees London being taken over the London Design Festival. World renowned design shows spring up across the city showcasing work from a broad spectrum of design disciplines. One of these shows, London Design Fair incorporating Tent London and Superbrands London takes up it usual post at the old Truman gallery on Brick Lane. I make an effort to visit this show each year to see first hand what is happening in the world of design. This year is no different in that regard and I am looking forward especially to see the Swedish design pavilion, the British craft pavilion and also the work of Shane Holland whom was an external examiner of mine while studying at the furniture college in Letterfrack. What is different about attending this year is that I will be lucky enough to see a piece of my own on display at the Eporta stand. Eporta is an excellent online business to business sourcing platform for trade customers. It brings together the work of over 800 (and rising) makers in one place to form a comprehensive directory of design where interior designers, architects and buyers can find any product they may need for their projects. i am not only thrilled to be a supplier to Eporta but am very honoured to have my work showcased as an example of what is available on the site. So should you find yourself anywhere nearby at the weekend do call in to what is always an inspirational show and drop by stand 98 where the prism coffee table can be viewed.